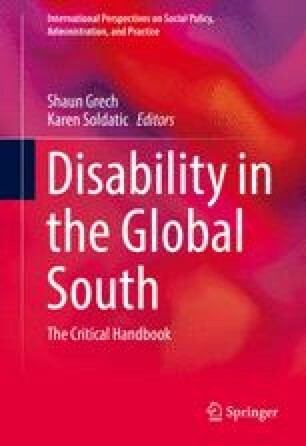 Although an estimated 80 per cent of the world’s disabled people live in countries of the global South (Grech 2011), most of what we know about impairment and disability is based on experiences of the minority in developed western nations. And despite critiques of this western-centric focus of disability studies emerging in recent years (e.g. Grech 2011; Meekosha 2011; Meekosha and Soldatic 2011; Chouinard 2012, 2014), there remains a pressing need for analyses that situate processes giving rise to impairment and disability in the context of colonial and neo-colonial relations of power and a highly unequal global capitalist order. Further, as Soldatic (2013) points out, there is a need to unsettle western conceptions of impairment as ‘natural’ that render the production of impairment in the global South invisible and uncontestable in terms of transnational justice claims.